The 3 things the iPad brings to publishing – noteworthy. In many ways, despite the its long-anticipated arrival, the iPad came into being well before anyone was ready. Naturally, it launched great fanfare but once the noise had died down, there seemed a collective shrugging of shoulders amongst content-owners as if to say, ‘well, what do we do now?’ with each waiting for the other to make a move. It was like the Droopy carton when a troop of Mounties is asked for a volunteer and in unison, they all step backward. All that is, apart from Droopy, left at the front, a volunteer by default.. Since then of course, there have been many different incarnations of iPad content, ranging from duplicated print publications through to bespoke built-for-the-device pieces. What remains however, is the underlying confusion about what form iPad content should take. I’m not talking about functional apps (build once, download once), I’m talking here about Content Apps, where the headline function remains the same but the content changes regularly. In other words, magazines. Confounding this confusion is a stubborn disinclination among magazine publishers to accept that a magazine designed for one media is unlikely to work well when published in another. The emphasis here is on working well. Sure, the same content can be made available in print, on the Web, on TV, on mobile devices and on tablets as well, but it is only likely to belong, it is only likely to truly work in the media for which it was originally designed. I make these comments not based upon unfounded theory, I make them because there are inherent mechanical differences in the ways in which consumers can interface with different media and as a result, differences in the way content should be constructed. For example, on the iPad there is no ‘mouse-over’ function whilst on the ‘desktop’ (which is destined to become a rather grey area), there is. This is not a deficiency of the iPad, it is simply an inherent aspect of the touchscreen interface which, unlike the desktop/mouse relationship is ‘normally off’ as opposed to ‘normally on.’ This is just one difference. There are many others that reinforce a philosophy of design-for-the-purpose. This is all very nice in theory of course but the implication is that a magazine publisher with a successful print brand must design a new product for every media. Throw in the iPad and there is not only a new media – the Tablet – there is also a new category, the device itself. Worse still, there are two design formats to consider – portrait and landscape. So in fact aside from the small matter of marketing and distribution strategies, discussed at length in this article, the print publisher must accept that the iPad incarnation of the brand is: a) a new product; b) likely to be proprietary to the iPad and; c) must be designed not once, but twice if portrait and landscape formats are deemed important to the consumer. Predictably, the initial hysteria around how many downloads of ‘this magazine’ or ‘that magazine’ has given way to a harsh reality: few, if any, are making money yet. This will change but only as a) business models stabilise and b) compelling content can be created efficiently on a regular basis. The ‘right’ business model for a given brand will only be found through time and experimentation (although Apple will have something to say if it involves ‘free‘) but the ability to efficiently create engaging content that belongs on and exercises the device is the greater challenge – and a truly massive opportunity. To date, Apple claim they have sold over 15 Million iPads. Last weekend my son’s 10yr old friend turned up with a an iPad in his bag. He’d forgotten he had one. Over-indulged 10yr olds aside, there is an important point here. In just 12 months, the iPad has become the fastest-selling new media device in history. Yet, despite its phenomenal sales as a media consumption device, there has been precious little iPad-specific media to actually consume. Magazines have been largely disappointing, where baffling user experiences and cumbersome downloads abound. It really is little surprise the early adopters haven’t returned in their original numbers. But when Forrester predict over 20 million iPads in circulation by in 2011, just imagine what this means to the content-owners that get it right. Sounds rather grandiose but the launch of iPad really is a defining moment. Why defining? because it marks a fundamental change in the way human beings interface with ‘intelligent’ devices. Touchscreen is nothing new but that’s not the point. It’s the execution that counts. The iPad is the first real-world incarnation of a well-executed touchscreen interface. As such, its significance cannot be underestimated. It is the catalyst for a completely new generation of human/electronic interaction. It will directly influence the way web content will be designed and built for at least the next decade. And just look what it started. 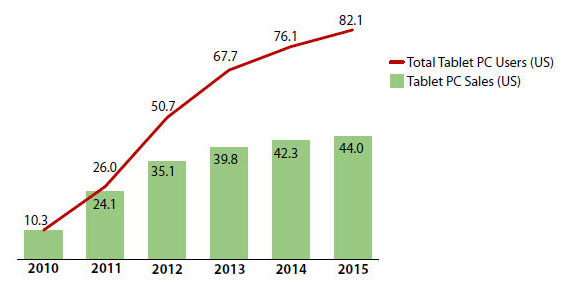 The chart below details the Tablet devices due in the next 12 months alone. I mean just look at it. Its incredible. Clearly, market forces will determine which of these devices live to see 2012 but just pause for a second and take another look at the list. Amazing isn’t it? 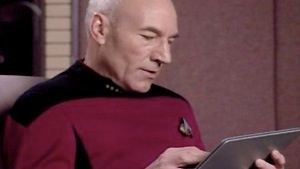 That the iPad represents a Defining Moment (deliberate use of uppercase) is frankly an understatement. This entry was posted in Design, Devices, Publishing, Technology and tagged apple, apple ipad, iPad, linkedin, steve jobs. Bookmark the permalink. Pingback: Not another iPad Article. | noteworthy.